Food packaging and food service operations are aware of the growing demand for compostable solutions. Savvy consumers, informed by a widespread eco-friendly movement, are making buying decisions based on the types of environmentally packaging offered by the places they shop at. Moreover, they may be influenced more positively or negatively toward a brand based on how well they feel the company is making “Green” or “Socially Responsible” choices. Many of the eco-friendly containers and tableware made by TPS are made from bamboo and bagasse (sugarcane). These crops are annually renewable, meaning they are able to grow back each year and replenish as quickly as they are consumed. And because they are made from naturally grown crops, they are 100% compostable. Plastic and polystyrene foam products can remain in our environment for years, littering our parks and waterways. TPS's eco-friendly bamboo and bagasse products can be returned back to nature through the simple and natural composting process. Aware consumers are speaking out, and more food service and product packagers are starting to take notice. Recently Dell Computers switched to natural compostable bamboo based packaging materials for shipping their computer systems. 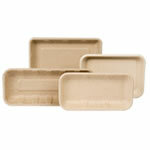 You can join in the solution by offering compostable containers and tableware from TPS at your plant or facility. Check out our line of eco-friendly products.